While Lexus is widely considered to be a world-class luxury brand, not everyone views the Japanese carmaker with the same level of prestige as European luxury brands. Lexus has suffered as a result, especially in Europe. Despite enjoying strong sales in the United States, a strong love of diesel in Europe has hindered the brand's success there. 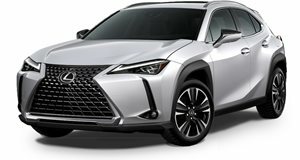 Lexus sold nearly 300,000 vehicles in the US in 2018 but only 12,405 units in the UK. This just goes to show how differently the Lexus brand is perceived in the US versus the UK. Even when looking at Europe as a whole, Lexus only sold just over 46,000 vehicles. Largely thanks to the new UX, Lexus expects its sales in the UK to rise by 20% to around 14,000 units. This UK sales increase will go along with the brand's larger plans to sell 100,000 vehicles per year in Europe. "Irrespective of the economy, people are walking towards hybrid and away from diesel. That lets us control our own destiny,” said Lexus UK boss Ewan Shepherd. The UX is sold as a 250h model, which pairs a 2.0-liter four-cylinder engine with a hybrid system to produce 176 horsepower. Lexus believes the UX 250h will be an appealing alternative to diesel-powered cars. The brand expects to sell 4,000 units in the UK in 2019, and 6,000 units in 2020. Even with the sales increase, Lexus won't come close to matching the sales volume of its German rivals, which may come now to brand awareness. "The LC is the first big car we could tell the story behind but it’s in an inaccessible segment,” Shepherd said. "Now we have the UX, which is in a very accessible segment.” It may not help Lexus reach the same sales volume as the European brands but it will be a massive step up for brand awareness in Europe. Your Lexus CT replacement has arrived. Sophisticated subcompact crossover takes the city car to new heights.